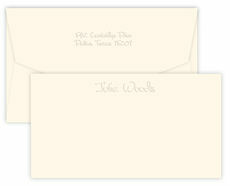 Set of embossed flat cards with matching blank envelopes. Your choice of stock color, 6.2" x 4.5". Typestyle only as shown. Optional embossed return address and envelope linings available.